Book a skilled lawn pro in Lafayette. Backed by a total satisfaction guarantee and amazing customer support. Need fast, affordable lawn care services in Lafayette, Louisiana? Lawn Love makes getting top quality lawn care services incredibly easy. Get an instant quote for lawn care services near you such as lawn aeration, lawn mowing, leaf removal, gutter cleaning, gardening, yard care, weed control and more. 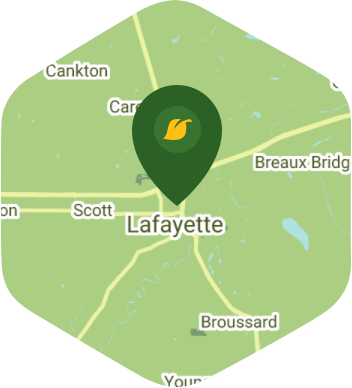 See why we're rated #1 in Lafayette! If you've ever thought "I need easy, fast lawn care services near me without the hassle" then Lawn Love is your answer. We've got the modern touch to the lawn care service industry and we pass those benefits on to you. All of our lawn care services are backed by a 100% satisfaction guarantee as well. Living in the Hub City of Lafayette gives you access to a lot of things but one thing it doesn't provide for you is more time. To commute back and forth to work or school, to do things with your friends and family, and to enjoy the spare time you have for yourself all takes time. When you factor in lawn care and maintenance, who has time for all of that? Something usually has to give and if it's not the lawn, then it's probably quality time with the people in your life who matter to you. Lawn Love may not be able to give you more hours in the day but we can help you to find something precious – more time. Lawn Love is a fully insured and bonded lawn care company. Our teams of skilled and experienced lawn care technicians know all that is required to care for your lawn. They want to work with you to create and maintain a lawn you can be happy to come home to at the end of a long day. We can take care of everything, from the weeding and seeding to the trimming and mowing – all you have to do is call to find out more. To take advantage of Lawn Loves free, fast and easy two-minute quote, just give us a call today at 337-706-9407 and find out just how much time Lawn Love can save you! Thank you, Andre, for being accommodating of some of the yard adjustments we have had to make for our new dog! Thank you to Andre! We have been away for the past month but you would never have known it because our lawn looked great when we got back! I appreciate how Andre works with me. My place looks great! We had a good conversation - I liked his offer to blow off my garden next time. I'm glad Andre saw the newly-uncovered water shutoff access and trimmed around it. We'll talk about Fall service when he comes out next. I liked how he edged before he mowed. Makes sense and leaves a cleaner job. Even edged the area by the road. Nice touch! Quick & thorough job - the place looks great! He came early, before the rain, and got the job done quick & clean. It looks great! Thank you, Andre. As always, you make the house look good! Really appreciate that Andre consistently and reliably does a great job. This man takes care of us like he lives here - he cares and pays attention to detail. He has more energy than I’ve ever before seen. Thank you, Andre, for the extra cleanup around our back patio area where a lot of leaves etc get stuck and make a mess. I had put aside the gutter runoff so it would not be in the way, and Andre replaced it once he had finished and I appreciated that. Really friendly. When I got home everything was perfect! Awesome service! Rated 4.95 / 5 stars in 111 Lafayette customer reviews. It looks like the expected precipitation in Lafayette is 0.67 inches, which means your lawn got a nice soaking—leave those sprinklers off today. Dusk and dawn are the best times to water your lawn (the sun will rise at 6:31 AM and set at 7:40 PM today in Lafayette). Here are some average lawn care prices for homes in Lafayette. Average lawn size 5,997 sq. ft.